Railroad and Light Rail Investigations - CED Technologies, Inc.
Our Railroad & Light Rail engineering experts find themselves investigating claims and litigation associated with various individuals involved with railroad operations: passengers, crew, and maintenance staff. 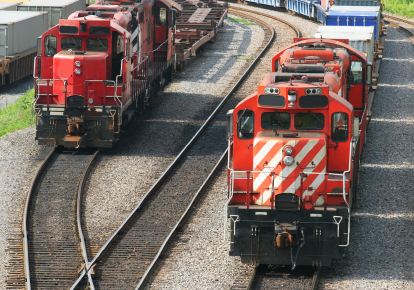 Unlike other industry employment claims, the Federal Employees Labor Act (FELA) allows railroad employees to sue their employer. The railroad industry retains engineering experts to investigate personal injury claims by employees of the railroad. Many claims result from workers getting injured on the job. Biomechanical engineering experts evaluate injuries sustained and qualify the actions/forces that caused the accident. Occasionally, personal injury is sustained by material failure such as steps and handrails giving way. For instance, the Metallurgist expert analyzes a failed bolt used to secure a step and determines the material quality, overloading, or excessive tightening of the bolt. Oftentimes, engineering experts conduct forensic engineering and failure analysis related to human factors contributing to accidents involving maintenance staff. Design of machinery, removal of guards, lack of interlock devices, or operator error may be contributing factors to maintenance accidents. During the investigation of these accidents, Mechanical Engineers and Human Factors experts utilize machine design, maintenance records, and operator tasking to determine the root cause. With such a large volume of passengers and employees, engineering experts utilize the English XL slip meter to help validate slip and fall accidents. This tool quantifies the slipperiness of hard surfaces such as railcar and station flooring. The measurement is on a scale of 0-1 and the results are regularly admitted into court. Of course, there are railroad crossing accidents and collisions between trains. Crossing accidents with pedestrians and vehicles often involve factors of visibility, safe speed, and perception-reaction time. Typically, forensic analysis leads to accident reconstruction to completely understand the involved parties actions and contributing factors. A Structural Engineer evaluates the worthiness of bridges and structures after a strike by a train or other moving asset such as tug and/or barge when they collide. Finally, Civil/Structural Engineers evaluate the structural integrity of the railroad track itself and underlying support material. Submit at Railroad or Light Rail case or claim online.